Picky eaters between the ages of 2 to 6 years old are often quite fearful of new foods. Serving meals deconstructed can help avoid initial complaints at the start of a meal and increase a child’s willingness to try new foods. 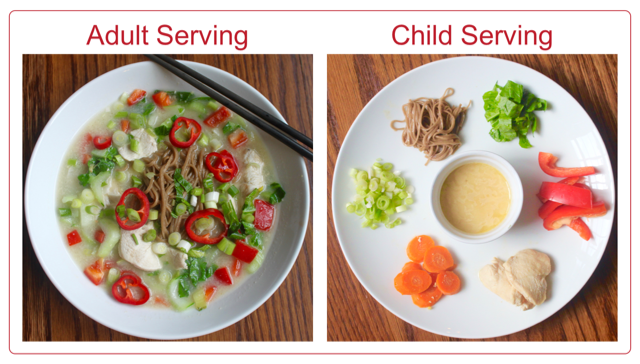 When introducing new foods or more complex “adult” meals to my picky eaters, I serve their meals deconstructed (example in picture below). I can avoid initial complaints like “I don’t like this” by spending an extra minute or two when serving a meal. Why does serving a deconstructed meal work? Food presentation is important. There is a reason we often hear that we “eat with our eyes first”. How visually appealing a meal is influences our opinion of how it will taste. Our perception of a meal’s appearance will in turn impact how we think it tastes. Chefs at fine restaurants know this and use it to their advantage. We should not treat our children as “mini adults” when it comes to how food is presented. 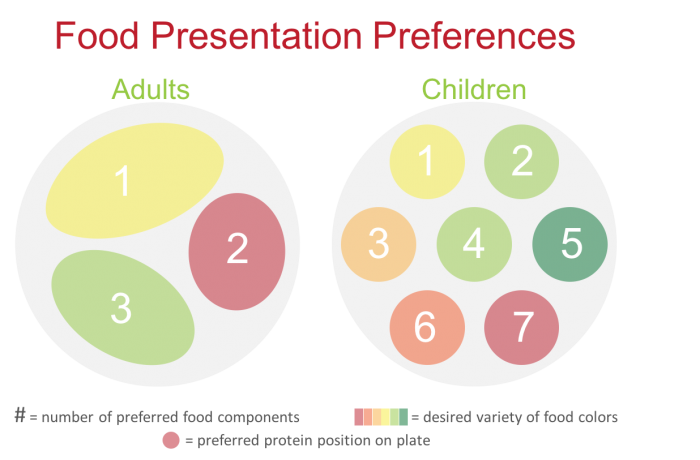 A study by the Cornell Food and Brand Lab (CFBL) evaluated food presentation preferences for both children (ages 5 – 13 years old) and parent-age adults.2,3 The study found that children do not share the same preferences for food presentation as parent-age adults. Unlike adults, children like to be presented with many different options in one meal. In the study, the children had a significant preference for the maximum number of seven food options on a plate. Adult participants preferred to only have three food elements on their plate. Because 7 options was the maximum presented in the study, it is unclear if children would prefer even more than 7 options. However, the realm of dinner preparation reality will often dictate how many options are available to our children. Key point: more options are good. If you are making a salad or stir-fry, serve the components separately. 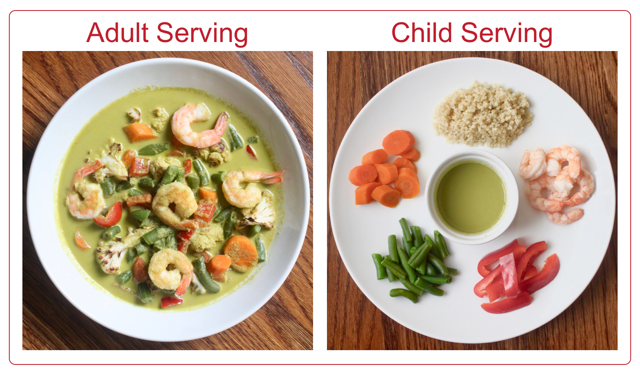 Similar to the number of components on a plate, children like to be presented with many different colors during one meal. In the CFBL study, the children tended to prefer having six different colors on their plate whereas the adults preferred only three. This is great news when we are trying to feed our children a diverse, colorful rainbow of vegetable options. Use this inherent preference in children to expand their daily intake of vegetables. The CFBL study also investigated the preferred location for the main dish or protein. Children had a preference for the lower right portion of a round plate while adults preferred the central right location. The researchers did not investigate handedness of the participants, it is unclear whether this influences the preference. The children and adults who participated in the CFBL study agreed on a few things. The first was that plates with some empty space were preferred to overcrowded plates. For children, at least, this should not be surprising. We have all either heard stories or experienced first hand when a child completely melts down when presented with a meal where the foods are touching. The researchers of the CFBL study admit that there are many follow-up studies that should be done. The most important may be studying whether using these preferred presentation methods influence actual food consumption. However, presenting a visually appealing meal may be just the thing to encourage your child to try the new recipe, vegetable, or flavor. Based on the unscientific studies conducted at my kitchen table, serving deconstructed meals according to these recommendations helps overcome the “what is this?” or “I don’t like this!” response. This also helps increase the diversity of foods that my boys eat, hopefully setting them up for healthier eating habits as adults. Finally, in addition to the recommendations above, the researchers at CFBL found that children also liked figurative designs. For example, a meal organized as a silly face or a sandwich in the shape of a heart. If you are trying to introduce a new food to your child or simply increase consumption of vegetables, consider trying this additional strategy.